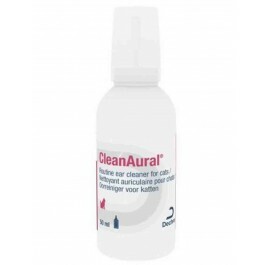 CleanAural Ear Cleaner for Cats is a specially formulated solution of organic solvents and moisturisers designed to clean both healthy and infected ears (with an intact eardrum) and maintain them in good condition. CleanAural Cat is specially formulated to suit the delicate lining of the cat ear canal. Formerly known as Leo, CleanAural Ear Cleaner helps to prevent itching and unpleasant odours in the ear by removing build-ups of earwax and dirt. CleanAural is strong enough to rapidly soften and dissolve hardened accumulated wax and debris yet gentle enough for regular use. CleanAural Ear Cleaner has the added benefit of not staining or discolouring the hair around the ears and is pH adapted for delicate skin in the ear canal. It can be used alongside topical antibiotics used to treat otitis externa. CleanAural Ear Cleaner is supplied with a soft applicator and is suitable for kittens and adult cats. It may help to have a helper to gently restrain the cat. Hold the ear back gently but firmly. Place the tip of the nozzle into the opening of the ear canal. Squeeze the bottle gently to deliver a few drops of CLEANAURAL® Cat. - Gently massage the base of the ear for a few seconds then let the cat shake her head. - Wipe inside the ear flap with clean cotton wool. - Repeat on the other ear. The product can be used as often as necessary, following the recommendation of your vet. Do not use if there is a chance the eardrum is ruptured.